It’s late. You have to be up early for work tomorrow, and you’re already tired from the long day you just had. You aren’t laying in bed though. 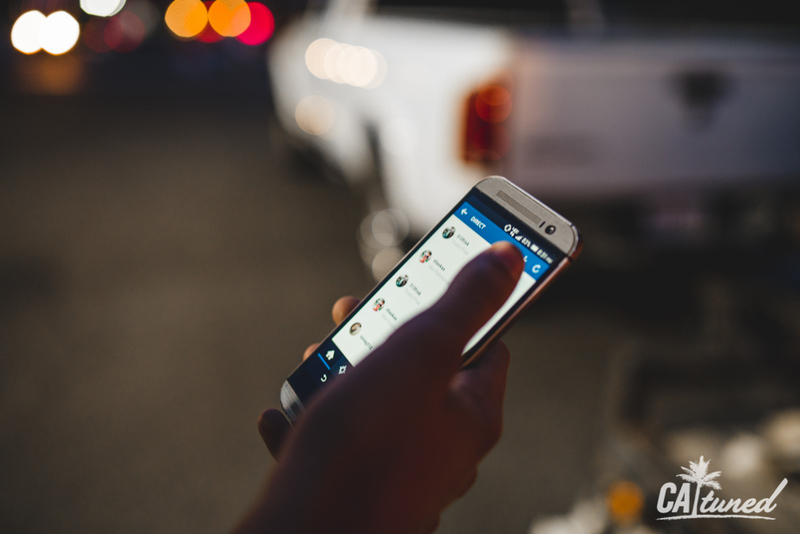 Instead, you’re glued to the glowing monitor of your computer, scouring the list of links to cars in your area. You’re determined to find the right one. There are a lot of junkers and scams, but you look through anything that sounds even the least bit promising. Just about anyone who has ever wanted to buy a car off Craigslist knows the feeling. This was my usual routine (daily or nightly) for the past several months this year. 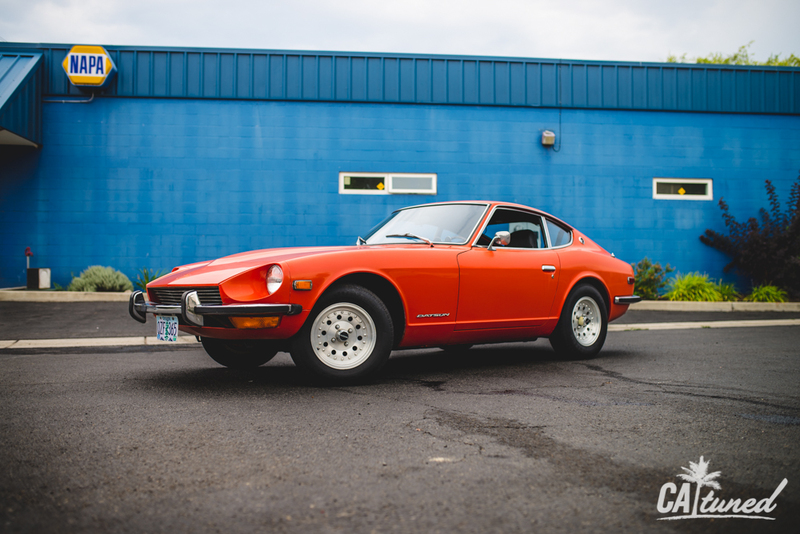 As a matter of fact, I’ve been lusting after my dream car, the Datsun 240z (yes, it HAS to be a first gen) for over a year now. It wasn’t until this year that I started to seriously pursue one. 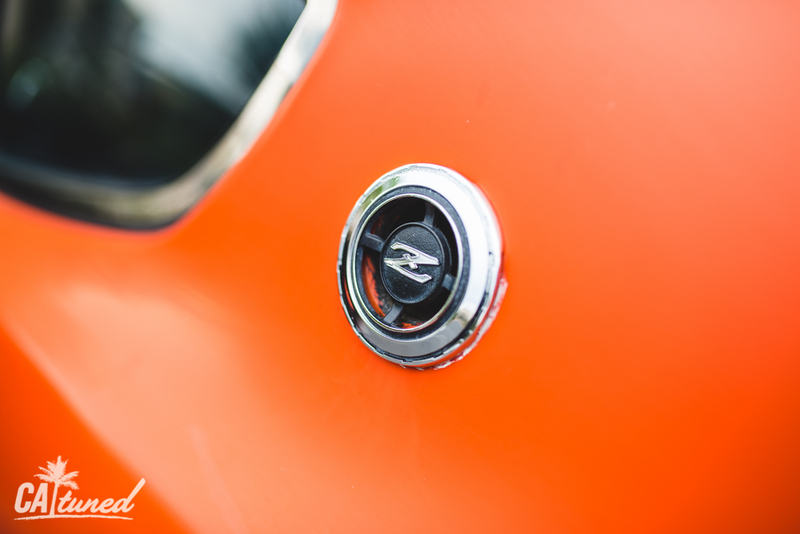 The first car I looked at was a complete scam, and it left me feeling discouraged. The second car, an ex-Scarab Z, just barely slipped through my fingers, as it sold the night before I would have gone to see it. 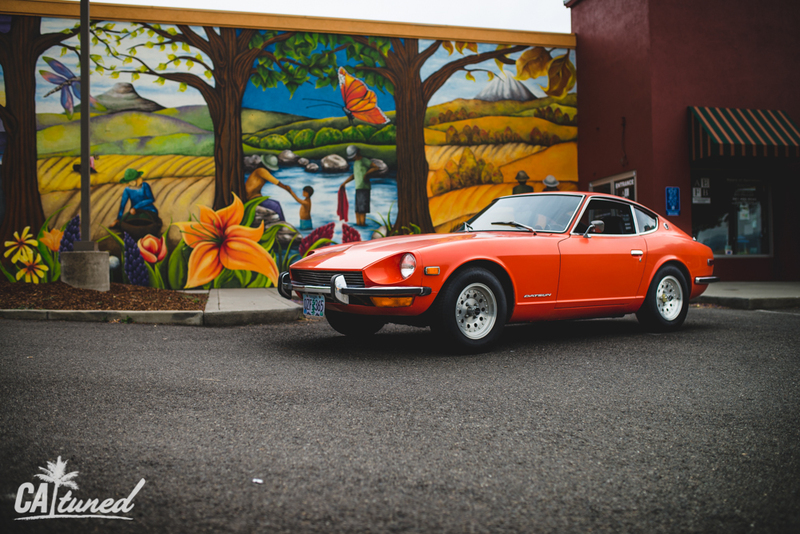 With the help of Igor, my boyfriend Dustin, and a friendly Z owner himself, JT, we searched the internet and private groups for months. Many potential cars came up, but it just never seemed to work out. Either it was out of my price range, required too much restoration, or was halfway across the country—there was always something that didn’t feel right. That is, until I found the one. While on break at work one day a couple weeks ago, I found myself searching the Oregon Craigslist. Yes, I was desperate and daydreaming. I happened upon one ad, which only showed two photos: one exterior, and one interior. The pictures were grainy and foggy, and the description sounded too good to be true, but something told me to contact the owner. After I emailed him, it was a couple days before I heard back. But when I did get a response, it was positive. We exchanged phone numbers and he sent me every photo of the car that I asked for, and answered all my questions. Over the course of one weekend, with several different phone calls, I became more and more excited. This was not a car I could simply go look at. It was 375 miles away from the San Francisco Bay Area, all the way in Oregon. I had to be absolutely sure that this was what I wanted. But again, it felt right. I made my offer and the next day, it was accepted. 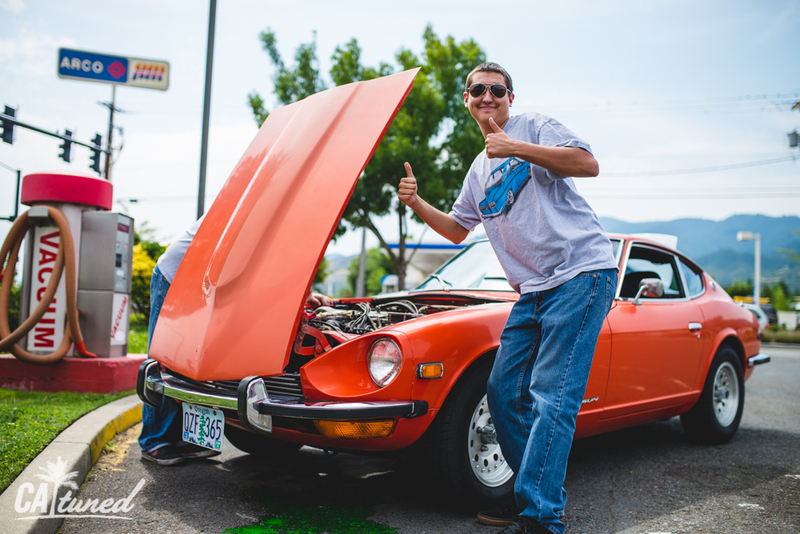 The following Sunday was marked on the calendar as the day I got to pick up my Z car. It was the slowest week in history, but it was worth waiting for. We drove to Sacramento the night before the trip in an attempt to shave a couple hours off the drive. 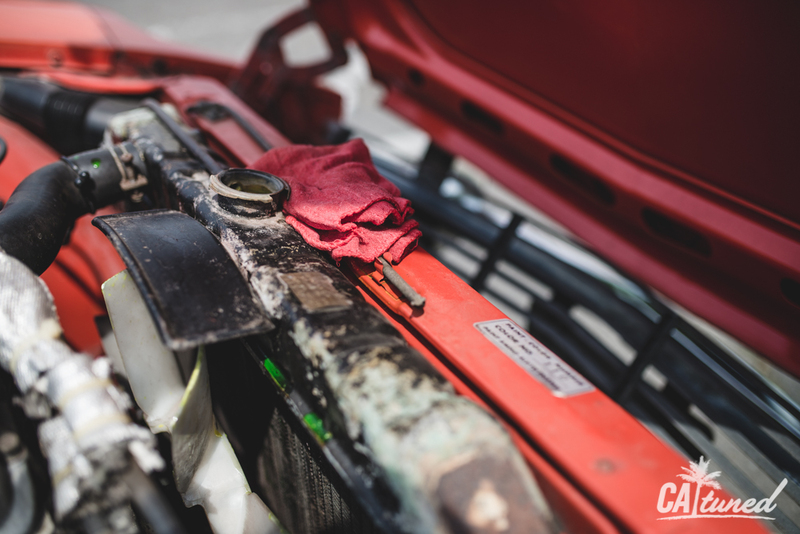 With a trunk filled with tools, coolant, oil, and just about anything else we could think of, we were off. Four AM the next morning, Igor, Dustin, and I began the journey. 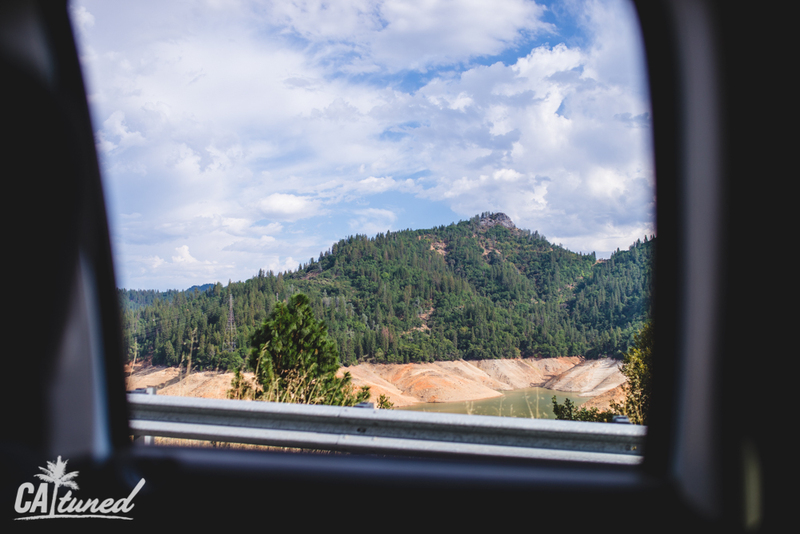 The drive to Oregon was beautiful once we got past the Redding/Red Bluff areas. Enormous mountains surrounded the i5, and we passed over incredible bridges spanning across massive lakes. The winding highway was definitely long, but the hours seemed to travel quicker on the drive up. We saw the Z immediately when we arrived at the address. 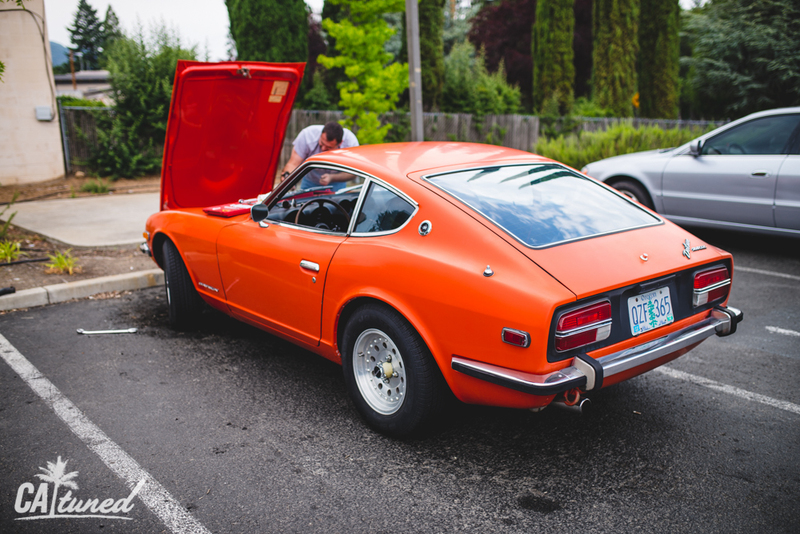 In the photos, it appeared to be red, but in person, it was a beautiful, bright orange (which made me even happier—I have a thing for orange Datsuns). Seeing my car for the first time in person sent my heart for a couple flutters. It didn’t really seem possible, because I had always felt that I would probably daydream about owning one for another few years. Regardless, the car was even more beautiful in person. 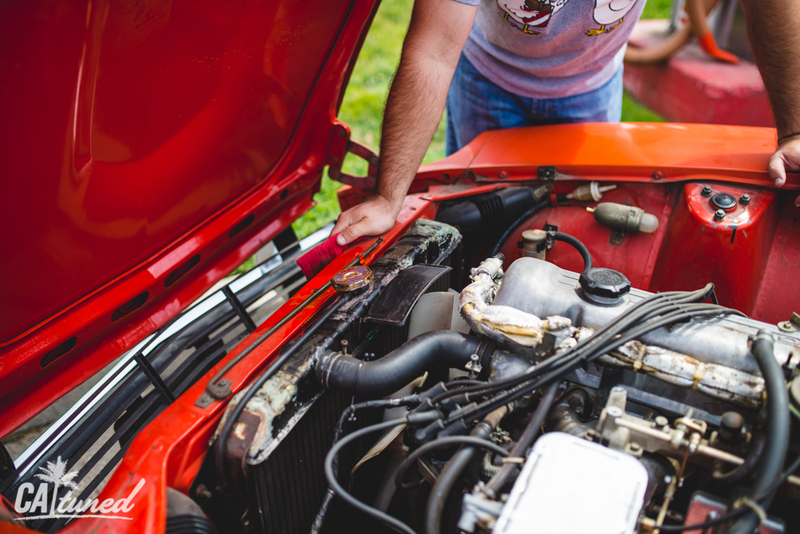 It is all original, with the exception of the wheels and dual weber carburetors, and a little bit of clutch and brake work. Although original, it was very clean and orderly, with very minor blemishes—still absolutely worth it. The owner and his friend let us look the car over and test drive it, and I could tell that they were glad we had made the trip. They told me that they had several potential buyers before me, but they had all fallen through. “I hope this doesn’t sound weird,” one of them said, “but we’re actually really happy it’s going to a girl. 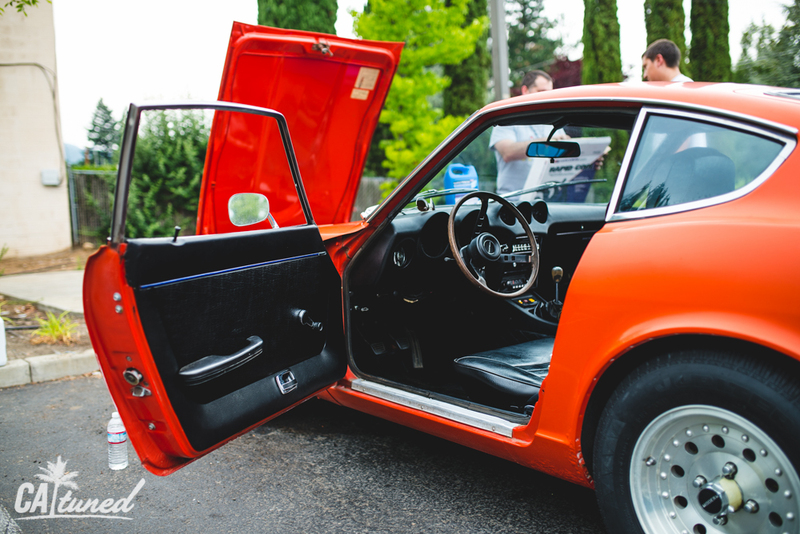 You’re the only girl to come look at it.” They told me that they could tell that I was passionate about the car even over the phone, and with the enormous number of questions I asked, they knew I was serious. 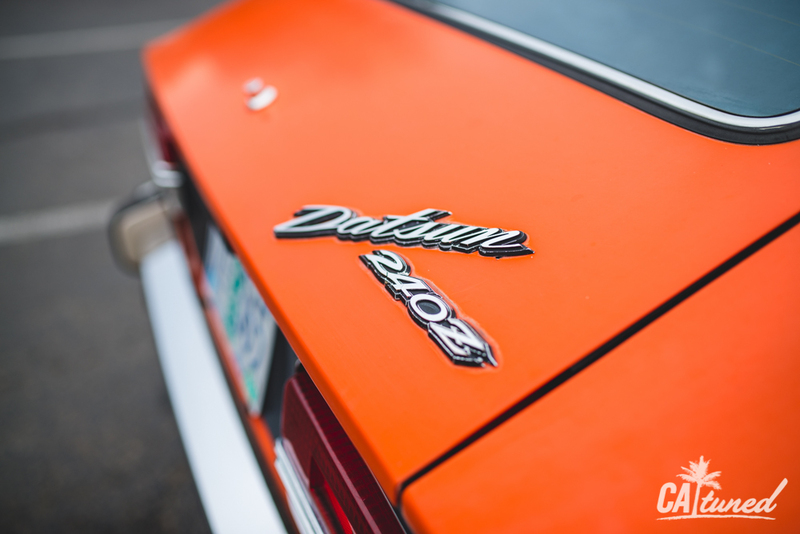 Within an hour, the title was signed over, we were given the original carbs, caps, and even the first officially licensed Nissan/Datsun die cast model, which happens to be a miniature twin of my actual car. With my head in the clouds, it was time to bring the Z home. Let’s start the rest of the blog post this way: the trip home did NOT go as planned. It had been not even ten minutes on the freeway, and the Z’s temp gauge started to climb rapidly. It surprised me at first, as the car ran perfectly on the test drive. Our only mistake was that we had not tested it on the freeway. 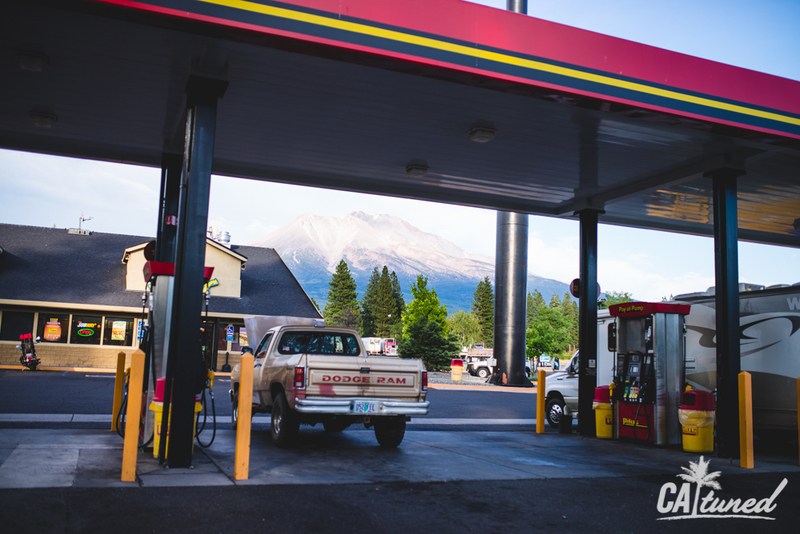 Reluctantly, we stopped at a gas station at the next exit. 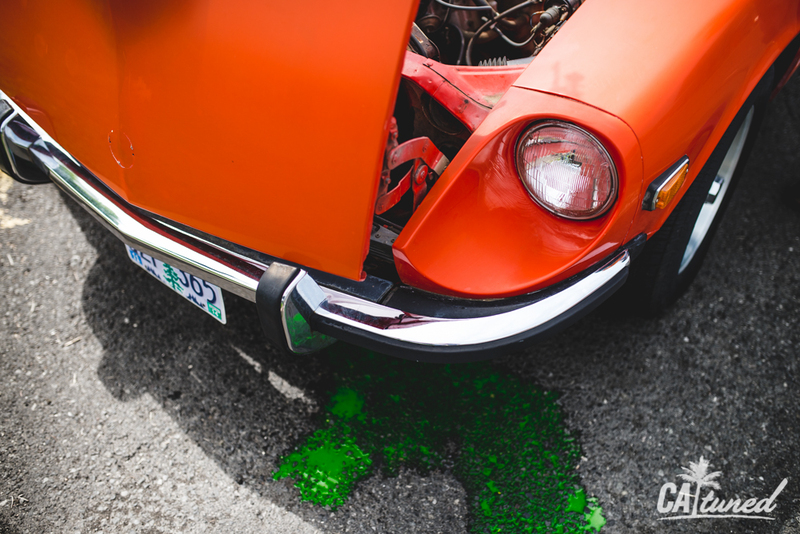 Upon popping the hood, we saw that coolant had hissed and fizzed out from the radiator. 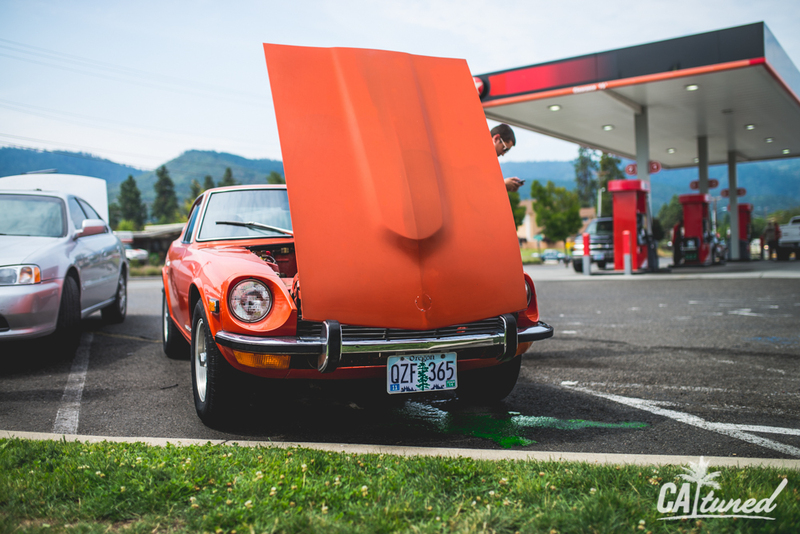 All those jokes about Datsun reliability suddenly came rushing into my head. At first, it was only a minor setback—or so we thought. 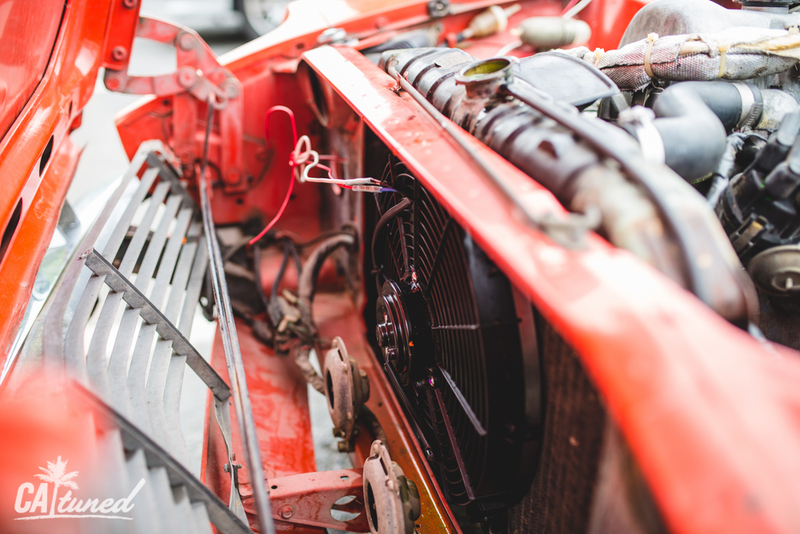 Taking a closer look, we found that the water pump was 100% dead, and the clutch fan was hardly doing its job. I called up the owner and he was in disbelief. Immediately he came to meet us and help out. 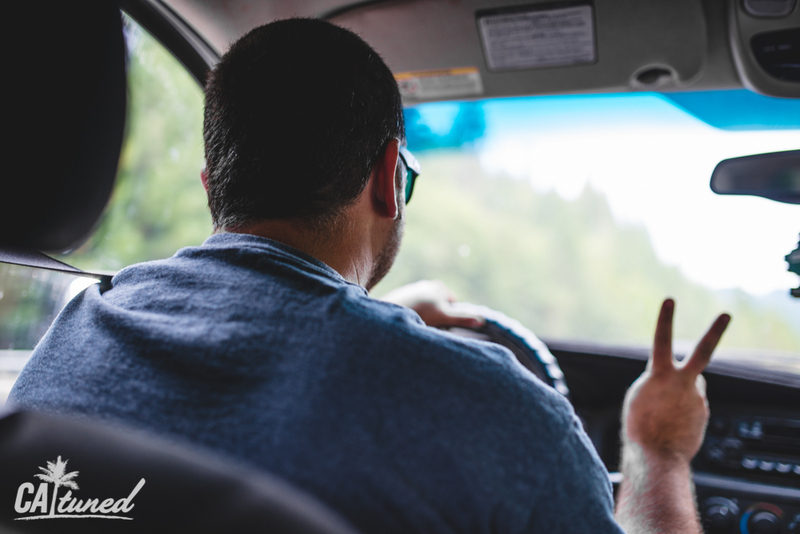 Dustin saw that there was a Napa store right down the street, but thanks to the small town area we were in, virtually everything that would have helped was closed. The owner managed to help us locate a parts store that was open, and it was only 20 minutes away. We hurried to grab a new cap and water pump while Igor and the previous owner stayed with the car. Upon returning, the gas station had forced us to leave, so we took refuge in that same empty Napa parking lot. 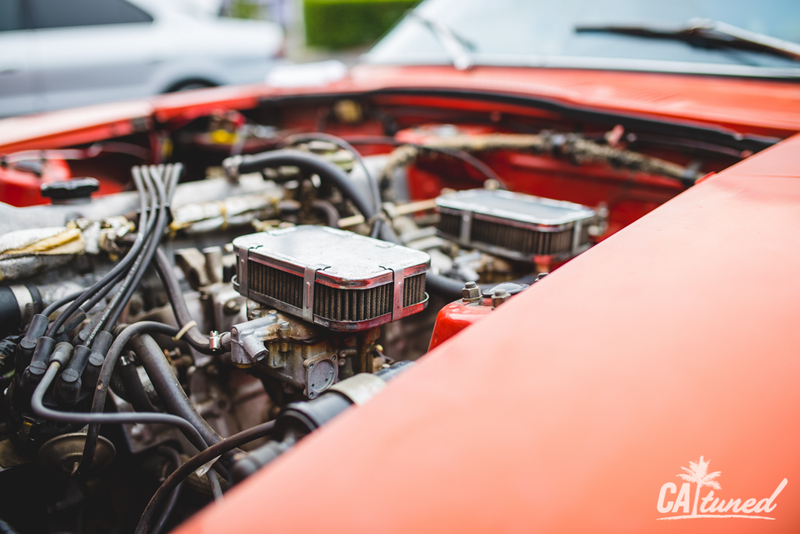 The original clutch fan was unable to mount to the new 280zx water pump. It was the only pump the store had available, and we were in no position to be picky. This left us with no fan, so we had to drive back (again) to purchase an electric fan. At this point, I was starting to feel sick with the heat and the stress weighing down on me. The guys were working so hard to make this dream of mine a success, and I felt guilty for dragging them into such a mess. 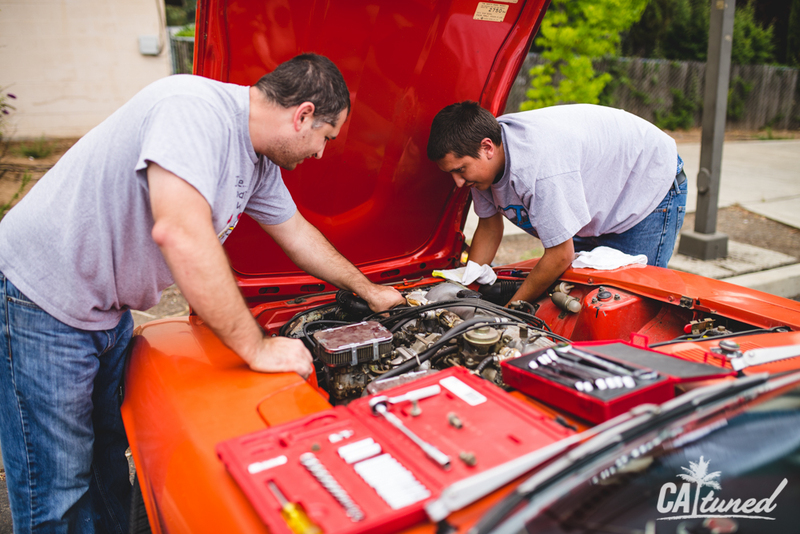 But the previous owner was very kind and helpful, and brought us any other tools we needed. After we mounted the fan, managed to wire it up, and pieced everything back together, we fired up the Z. 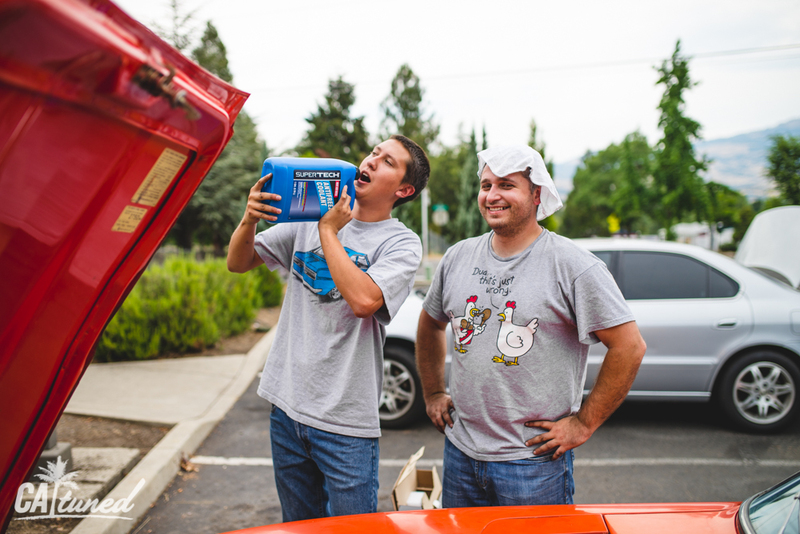 It was exactly what we had hoped: no more overheating. We were exhausted, but eager to get back on the road. After a quick dinner stop, we hopped back on i5 and started the steep mountain pass incline. 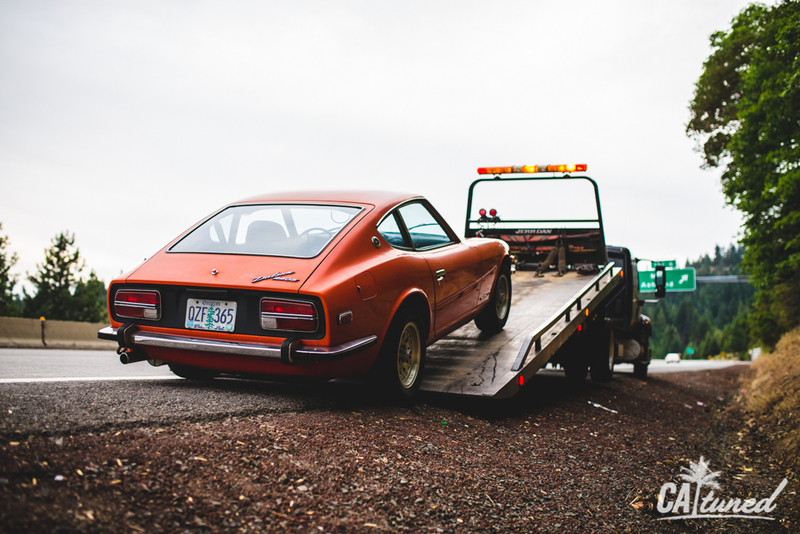 Unfortunately, we made it perhaps halfway up the mountain before the poor Datsun couldn’t handle it anymore. Prior to dying numerous times, it began to backfire, sputter, and run like absolute garbage. But at 5,000 feet above sea level, and with a pair of carbs that I had no background on, the problem seemed pretty obvious to us. 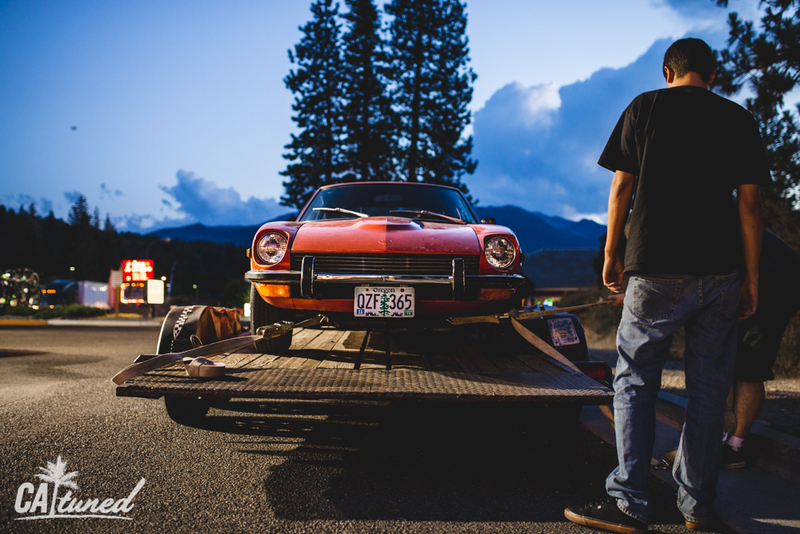 Unable to efficiently manage fuel flow, the Z called it quits, leaving us stranded on the side of the highway. 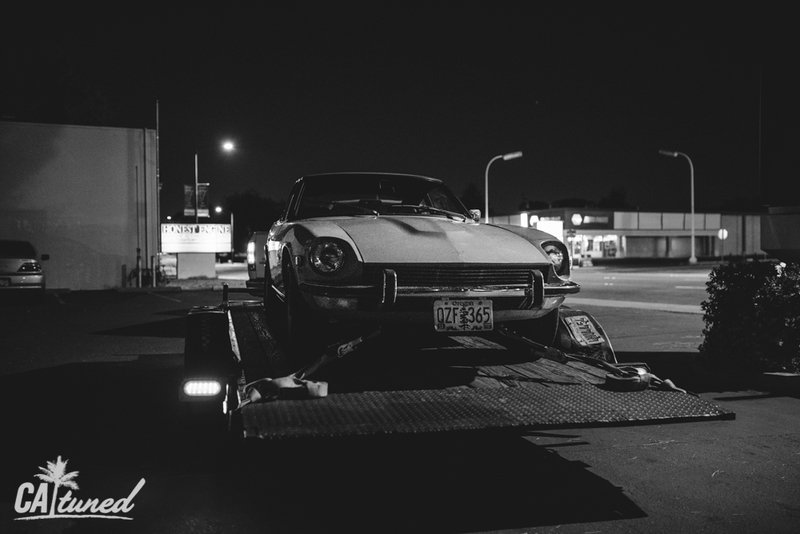 Luckily we had a second car, but it was no help in trying to figure out how to get the Datsun home. I called AAA and was reminded that I only had 100 miles of free towing, and the tow back to Sacramento would cost a whopping $1,300. 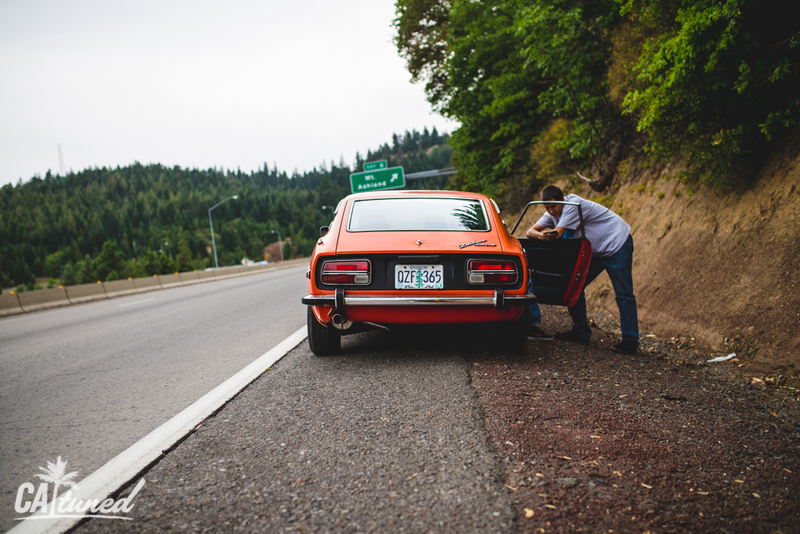 My other option was to tow the car to the nearest town, Shasta, and leave it unattended overnight. At this point, I had to put the operator on hold as I started to cry. Yeah, I was a bit of a baby. But I felt stranded, overwhelmed by the looming possibility that maybe this wasn’t going to work out. Luckily, I have the best friends in the world, and with some hugs and words of comfort, I managed to pull my emotional state from the black pit it had fallen into. The tow truck arrived less than an hour later. Luckily, he was very friendly, and probably pitied me, seeing as I looked pretty pathetic, sniffling and wiping my eyes. 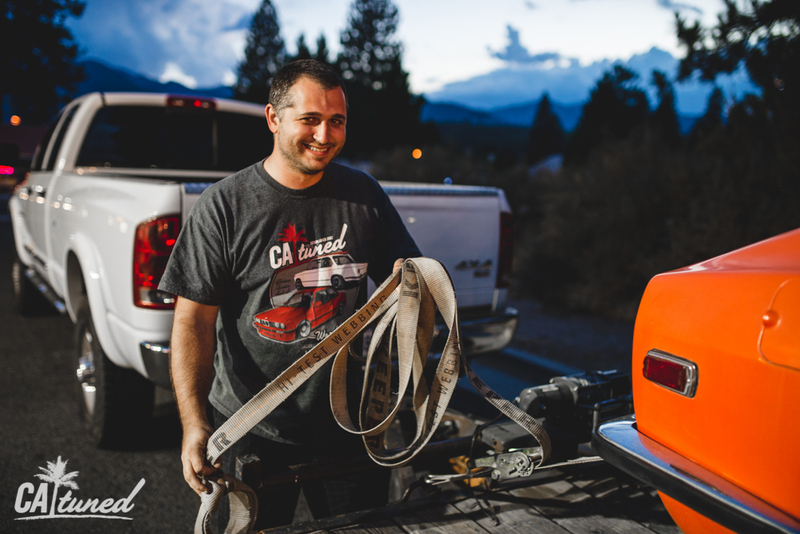 He said he would be able to tow the car back to town, then meet us in Weed, California the next day. Immediately, I felt a huge chunk of stress fall away. 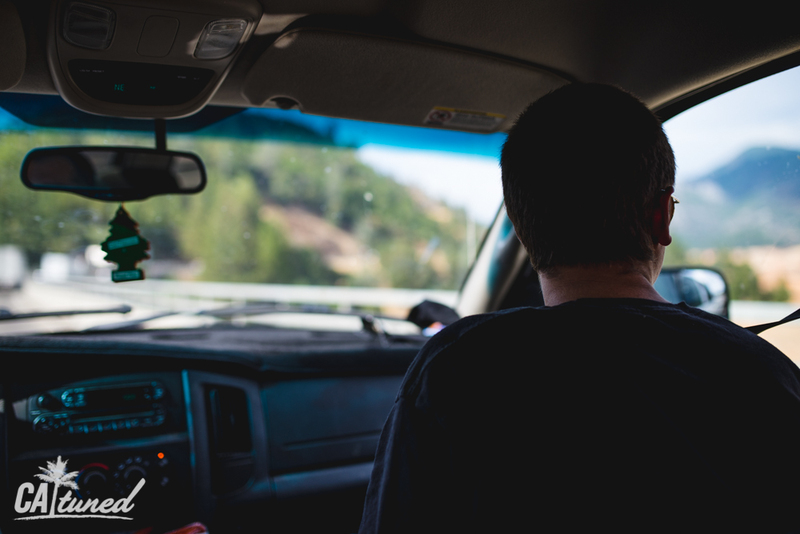 The car would be kept in a secure AAA yard, instead of being left alone for whatever stranger decided to break into it in a dark Shasta parking lot. Feeling a weird combination of both victory and defeat, we parted ways with the Z and made the drive back to Sacramento. There wasn’t much sleep to be had that night, as we got back around 2:00am, and at 5:30am, I woke up and became physically ill from the stress. 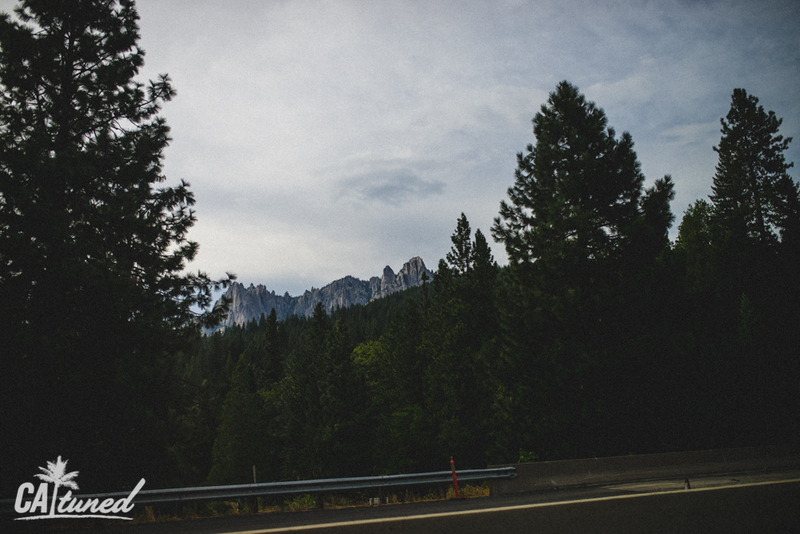 Have you ever driven almost six hours each way, to and from Oregon, twice in two days? I didn’t think so. Let me tell you, it isn’t fun. As a matter of fact, I hope I never have to do it again. Regardless, it was for a good cause. The next day, we borrowed a trailer and truck, and once again, we were off. 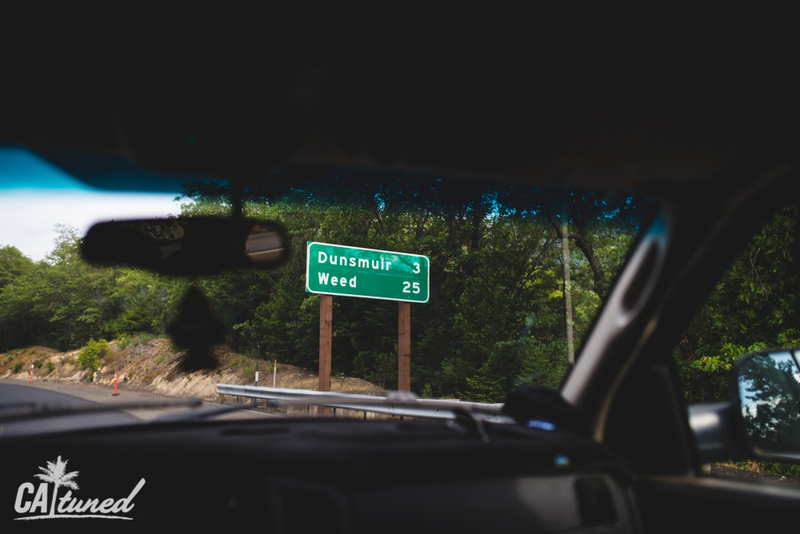 This time we were headed to the border town of Weed. The drive was a little more painful than the other two trips, as we were restricted to 55 - 65 mph. It’s a good thing we had made both trips the previous day either extremely early in the morning or extremely late at night, because this time, we could actually enjoy more of the landscape. We arrived in Weed at 6:00pm. 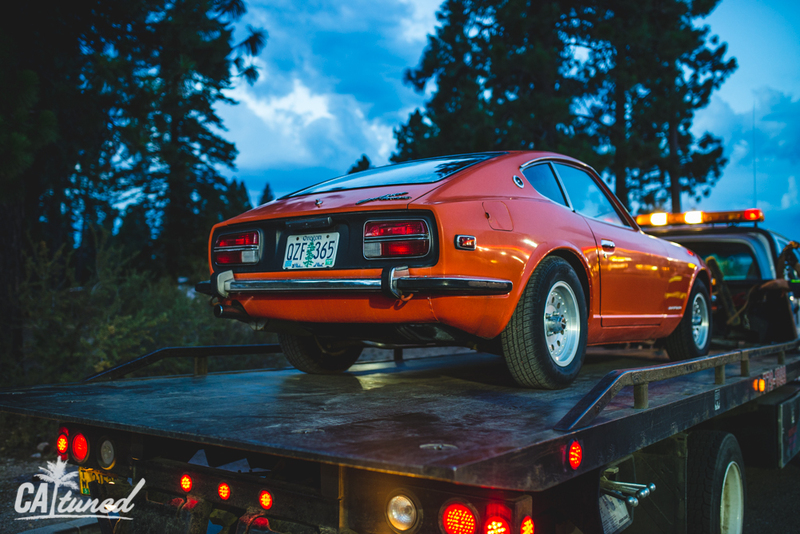 I had been checking in with the tow company periodically, and at this time, the Z was being loaded onto the trailer and was scheduled to leave immediately. At least, that’s what we were told. I’m not quite sure how the tow truck turned an hour and a half drive into a three hour one, but he made it happen. He pulled into the truck stop we were waiting at just short of 9:00pm. Thankfully, loading the car took maybe 20 minutes, and we were soon back on the road. 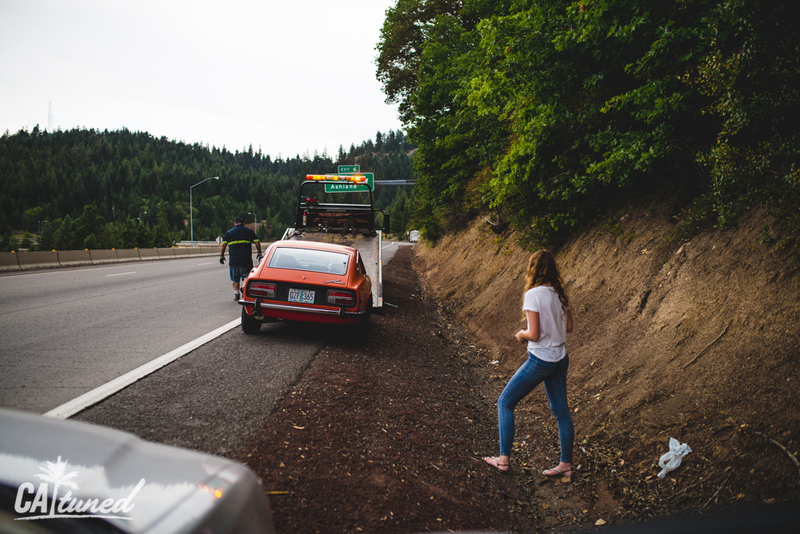 At this point, after everything that had gone wrong, the only thing left would be for the car to somehow fall off the trailer on the freeway. It wouldn’t have surprised me with the luck we had on this trip, but in our favor, it didn’t. We safely arrived at the shop around 1:30am. 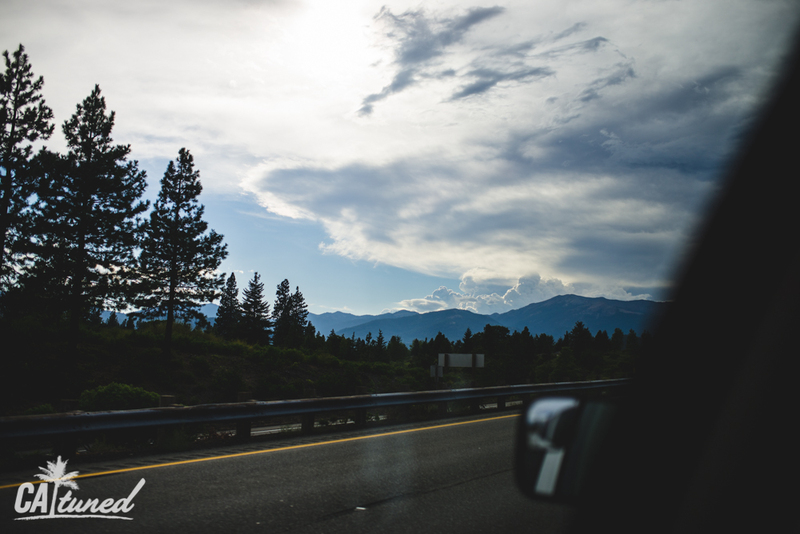 As we drove through the mountains that night, back toward Sacramento, we were met with lightning storms and mild rain. 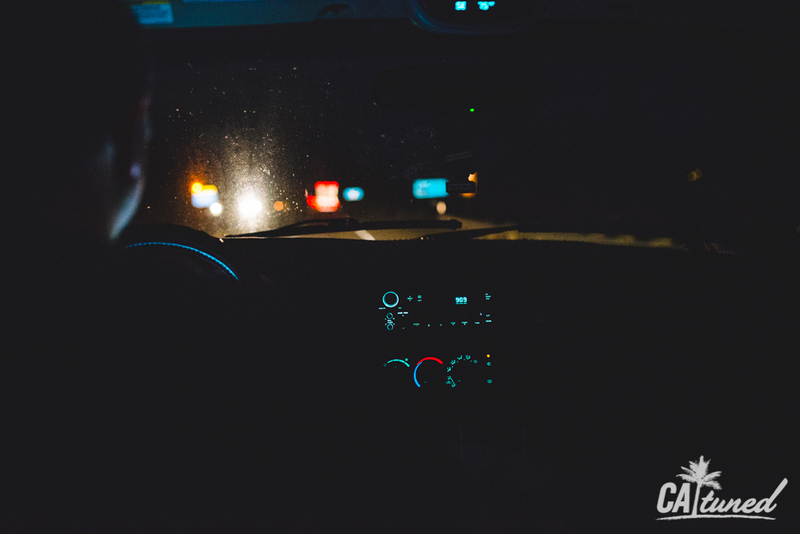 It was a beautiful thing to enjoy as we carved through passes on the dark highway. This drive felt especially long to me, but I was at ease whenever I looked back and saw the Z on the trailer behind us. It was almost like one of those moments in a really intense movie, after the main characters overcome huge obstacles. And all you’re left with is a sort of peacefulness in knowing that it’s over. 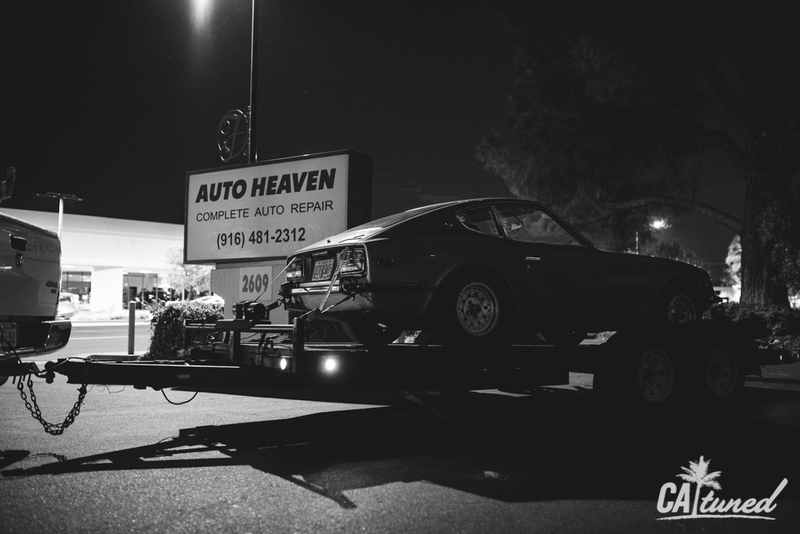 I guess what I learned from this experience is that no matter how much confidence you have in an old car you’ve never seen before, just be safe and bring a trailer. In hindsight, I don’t know why I thought it would be so easy to drive the car for six hours back home. I was a little too excited, I suppose. 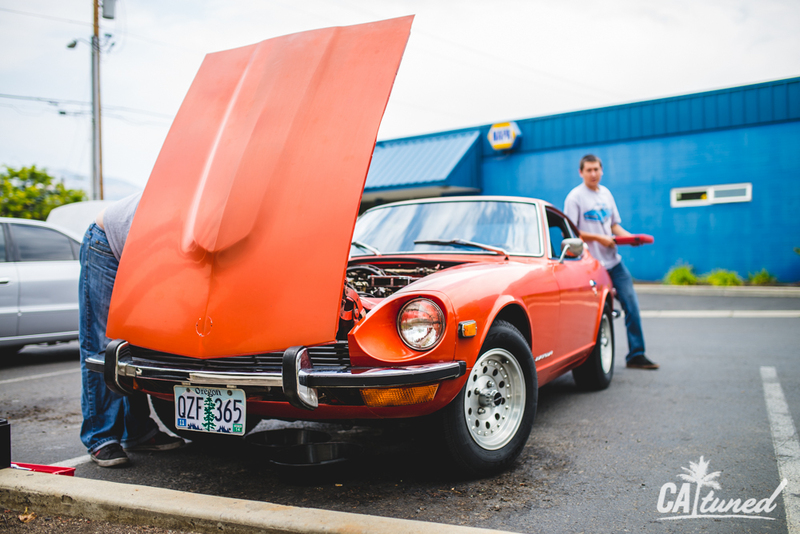 Ultimately, it was a learning experience, and one hell of a way to introduce my Datsun. Without such great friends, I wouldn’t have been able to make this trip. It is now safe with CAtuned, and we look forward to bringing you updates on my new build. Special thank you to Igor, Dustin, JT, and my family for the support! Congratulations on the amazing car! Can't wait to see it in person! Wow! I've had very similar experiences. 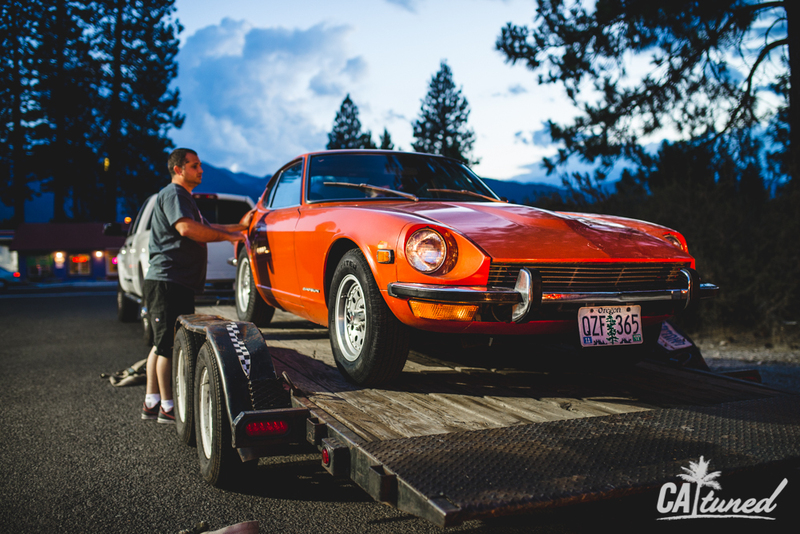 I too have a 240Z and did the same thing you did from California to Idaho. 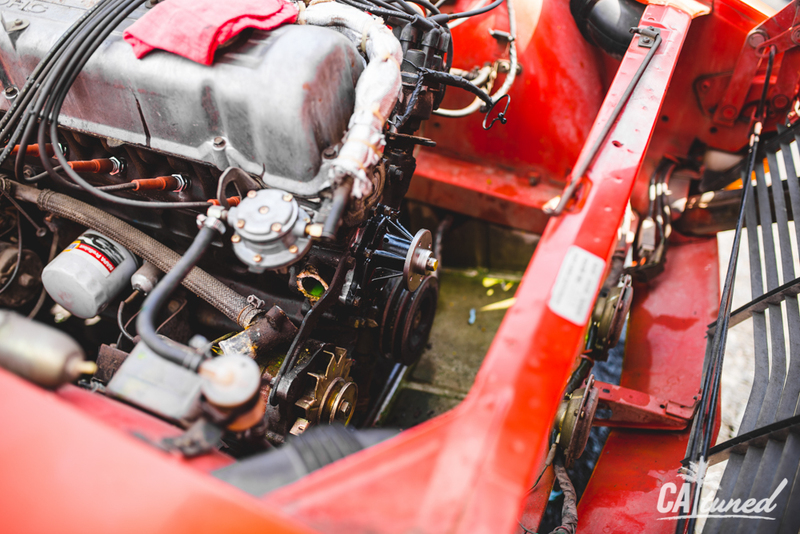 I also had carb issues getting home and then I had some issues with the engine after getting home. I still love these cars!